The Arctic National Wildlife Refuge is a wildlife refuge in northeastern Alaska. The refuge consists of 19,300,000 acres (78,000 km²) on Alaska's North Slope. It extends from the Beaufort Sea on the north to the Ogilvie Mountains on the south, with the Canadian border forming its eastern boundary. 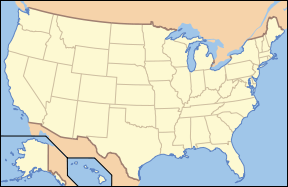 The wildlife refuge is the largest protected Wilderness area in the United States. The Refuge was created in 1960 during the Eisenhower Administration by Public Land Order 2214. Later it was expanded during the Carter Administration, in 1980 through the Alaska National Interest Lands Conservation Act. When it was passed by the United States Congress, the Act designated a specially protected area within the Refuge, known as "1002 Area." In the early twenty-first century, this area became a source of controversy between environmentalists and proponents of oil drilling. Arctic National Wildlife Refuge protects a pristine and unspoiled environment that spans five different ecological regions. Located in the eastern part of the Brooks Range, it is home to much of the diverse and spectacular wildlife in the Arctic. The abundance of wildlife found there includes 36 different fish species, land mammals such as caribou, musk oxen, wolverines, and wolves, nine marine mammals such as sea lions, seals, and otters, and more than 160 migratory and resident bird species. 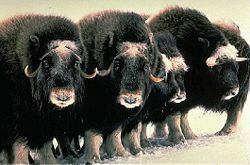 Musk oxen make their home in the Refuge. The Arctic National Wildlife Refuge supports a greater variety of plant and animal life than any other protected area in the Arctic Circle. 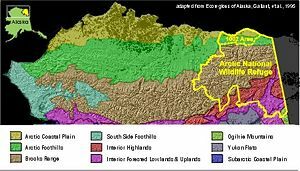 It contains remote, complete, and undisturbed lands across five different ecological regions within a continuum of six different ecozones that span some 200 miles (300 km) north to south. These include the Arctic Coastal Plain, with lagoons, beaches and saltmarshes; Arctic Foothills, containing coastal plain tundra; Brooks Range consisting of alpine tundra; Interior Highlands, which along with the Interior Forested Lowlands and Uplands, comprise the forest-tundra transition south of the mountains; and the Ogilvie Mountains, containing tall spruce, birch, and aspen of the boreal forest. The Refuge is located in a region of extensive cold, and much of its soils are underlain with permafrost. The Beaufort Sea washes against the north coast of the Refuge. These waters remain ice-covered for eight or more months each year. The ice pack is the winter home for polar bear and numerous seals. During the summer, whales migrate through these waters. Along the northern boundary of the refuge, barrier islands, coastal lagoons, salt marshes, and river deltas provide habitat for migratory waterbirds including sea ducks, geese, swans, and shorebirds. Fish such as dolly varden and arctic cisco are found in nearshore waters. Coastal lands and sea ice are used by caribou seeking relief from biting insects during summer, and by polar bears hunting seals and giving birth in snow dens during winter. The Arctic coastal plain stretches southward from the coast to the foothills of the Brooks Range. This area of rolling hills, small lakes, and north-flowing, braided rivers is dominated by tundra vegetation consisting of low shrubs, sedges, and mosses. Caribou travel to the coastal plain during June and July to give birth and raise their young. Migratory birds and insects flourish here during the brief Arctic summer. Tens of thousands of snow geese stop here during September to feed before migrating south, and musk oxen live here year-round. South of the coastal plain, the mountains of the eastern Brooks Range rise to over 9,000 feet (3,000 m). This northernmost extension of the Rocky Mountains marks the Continental divide, with north-flowing rivers emptying into the Arctic Ocean and south-flowing rivers joining the Yukon River. The rugged mountains of the Brooks Range are incised by deep river valleys creating a range of elevations and aspects that support a variety of low tundra vegetation, dense shrubs, rare groves of poplar trees on the north side and spruce on the south. During summer, peregrine falcons, gyrfalcons, and golden eagles build nests on cliffs. Harlequin ducks and red-breasted mergansers are seen on swift-flowing rivers. Dall sheep and wolves are active all year, while grizzly bears and arctic ground squirrels are frequently seen during summer but hibernate in winter. The southern portion of the Arctic Refuge is within the taiga (boreal forest) of interior Alaska. Beginning as predominantly treeless tundra with scattered islands of black and white spruce trees, the forest becomes progressively denser as the foothills yield to the expansive flats north of the Yukon River. Frequent forest fires ignited by lightning result in a complex mosaic of birch, aspen, and spruce forests of various ages. Wetlands and south-flowing rivers create openings in the forest canopy. Neotropical migratory birds breed here in spring and summer, attracted by plentiful food and the variety of habitats. Caribou travel here from farther north to spend the winter. Year-round residents of the boreal forest include moose, lynx, marten, wolverines, black and grizzly bears, and wolves. Each year, thousands of waterfowl and other birds nest and reproduce in areas surrounding Prudhoe Bay and Kuparuk fields and a healthy and increasing caribou herd migrates through these areas to calve and seek respite from annoying pests. Oil field facilities have been located and designed to accommodate wildlife and utilize the least amount of tundra surface. Mardy and Olaus Murie who, along with George Collins and Lowell Sumner, were considered the founders of the Arctic National Wildlife Refuge. A grassroots movement seeking to protect this corner of Alaska began in the early 1950s. National Park Service planner and conservationist George Collins and biologist Lowell Sumner, along with Wilderness Society President Olaus Murie and his wife Margaret Murie, launched a spirited campaign to permanently safeguard the area. Their efforts ignited a movement which was supported by thousands of the era's prominent conservationists, sportsmen's groups, and garden clubs. Collins, Sumner, and the Muries are considered founders of the Refuge. The region first became a federal protected area in 1960 by order of Fred Andrew Seaton, Secretary of the Interior under U.S. President Dwight D. Eisenhower. It was created by Public Land Order 2214 "For the purpose of preserving unique wildlife, wilderness and recreational values..."
In 1980 the Alaska National Interest Lands Conservation Act enlarged the area, designated much of the original Range as Wilderness under the 1964 Wilderness Act, and renamed the entire area the Arctic National Wildlife Refuge. Near the Sheenjek River, whose headwaters are the U.S.'s most remote area. Eight million acres (32,000 km²) of the refuge are designated as wilderness area. 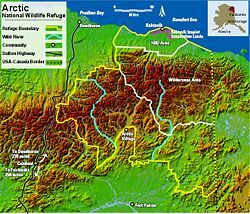 The expansion of the refuge in 1980 designated 1.5 million acres (6,100 km²) of the coastal plain as the 1002 area and mandated studies of the natural resources of this area, especially oil exploration. Congressional authorization is required before oil drilling may proceed in this area. The remaining 10.1 million acres (40,900 km²) of the refuge are designated as "minimal management," a category intended to maintain existing natural conditions and resource values. These areas are suitable for wilderness designation, although there are presently no proposals to designate them as wilderness. There are no roads within or leading into the Arctic National Wildlife Refuge, though there are settlements there. On the north shore of Barter Island at the Refuge's northern edge is the Inupiat village of Kaktovik. Arctic Village is a Gwich'in settlement on the east fork of the Chandalar River on the southern boundary of the Refuge. A popular wilderness route and historic passage exists between the two villages, traversing the refuge and all its ecosystems from boreal, interior forest to Arctic Ocean coast. Generally, visitors gain access to the land by aircraft, but it is also possible to reach the refuge by boat or by walking (the Dalton Highway passes near the western edge of the refuge). In the United States, the geographic location most remote from human trails, roads, or settlements is found here, at the headwaters of the Sheenjek River. Because the Arctic National Wildlife Refuge is believed to contain a large supply of crude oil, the question of whether to drill for oil has been an ongoing political controversy since 1977. Interest in the oil resources of northern Alaska began with reports in the early 1900s of surface oil seeps along the Arctic coast east of Point Barrow. In 1923, a 23-million acre Petroleum Reserve was established to secure a supply of oil for future national security needs. During World War II, the entire North Slope of Alaska - 48.8 million acres - was withdrawn from entry under the public land laws and held for exclusive use by the United States government for military purposes. By the 1950s accelerated resource development caused mounting concern for the region's natural environment and potential loss of habitat. Establishment of the Arctic National Wildlife Refuge followed. In 1968 the largest oil field in North America was discovered on state land in the Prudhoe Bay area, and additional petroleum discoveries have since been made on Alaska's North Slope. Reserves of oil were also believed to exist in the Arctic National Wildlife Refuge. The fate of the Range was extensively debated in Congress for years before passage of the Alaska National Interest Lands Conservation Act of 1980. 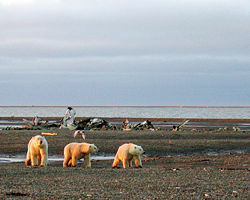 The Refuge is the only area on Alaska's North Slope where petroleum development is specifically prohibited by Congress. The remainder of the region is available for oil and gas development. Protected by the Alaska National Interest Lands Conservation Act is an area known as "1002 Area." This narrow strip of land includes only 10 percent of the total Refuge acreage, but includes most of the Refuge's coastal plain and arctic foothills ecological zones. Wedged between the Brooks Range and the coast, it is considered critically important to the ecological integrity of the whole Arctic Refuge, providing essential habitats for numerous internationally important species. Much of the debate over whether to drill in the Refuge rests on the amount of economically recoverable oil, as it relates to world oil markets, weighed against the potential harm oil exploration might have upon the natural wildlife, in particular the calving ground of the Porcupine caribou. ↑ US Fish and Wildlife Service. ANWR Wildlife and Wild Landscapes Retrieved February 10, 2009. ↑ Elizabeth Shogren. November 10, 2005. For 30 Years, a Political Battle Over Oil and ANWR National Public Radio. Retrieved February 10, 2009. ↑ US Fish and Wildlife Service. History of the Arctic Refuge as it relates to Oil in Alaska Retrieved February 10, 2009. ↑ US Fish and Wildlife Service. The Unique Conservation Values of the Arctic Refuge Retrieved February 10, 2009. ↑ US Fish and Wildlife Service. Potential Impacts of Oil and Gas Development on Refuge Resources Retrieved February 10, 2009. ↑ Natural Resources Defense Council. March 10, 2005. Toxic spills and air pollution from permanent, year-round operations are destroying Alaska's fragile North Slope. Retrieved February 10, 2009. ↑ John G. Mitchell. August 2001. Oil Field or Sanctuary? National Geographic Magazine. Retrieved February 10, 2009. U.S. Fish and Wildlife Service. Arctic National Wildlife Refuge Retrieved February 10, 2009. History of "Arctic National Wildlife Refuge"
This page was last modified on 12 April 2016, at 15:39.